Levi's Makes Jeans With 100% Recycled Water. 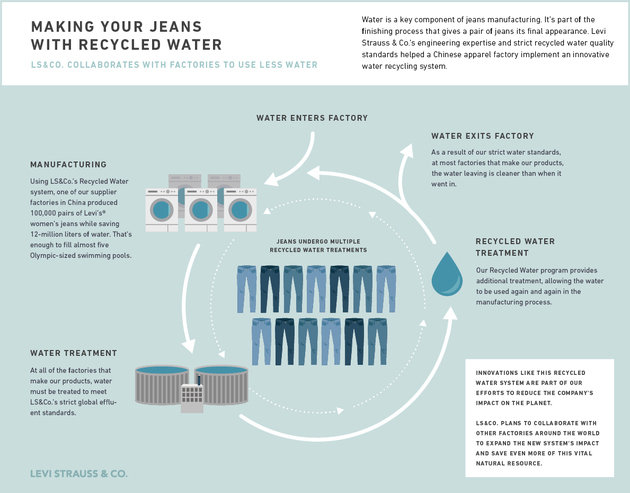 Levi's has developed a new way to make jeans using 100% recycled water. The drought currently affecting California reminded everyone of the need to protect this valuable vital resource and it seems like the label is looking to do its part in minimizing the impact its products have on the environment. Though the Water<Less line introduced in 2010 used between 28% to 96% water for jeans manufacturing, the label's efforts didn't stop here. The clothing manufacturer has announced it has already manufactured 100,000 pairs of jeans using this technique and reported it has saved a staggering 12 million liters of water in the process, enough water to fill almost five Olympic sized swimming pools. It seems that Levi's jeans made with 100% recycled water are an industry first and that the company claims it has created a standard for water recycling across the industry. How does the process work? Well, the brand has developed a system to treat the water used in the finishing process for the jeans to be used again in the manufacturing rather than using fresh water. The process is currently used in a factory in China and is verified by third party validators. Apparently, the process can be repeated multiple times without loses in terms of quality and this is why the label plans to continue with the project and implement the same process for other factories across the world. In fact, given the reduction in terms of manufacturing costs as well as in the resources used, the plan is to use the same process for all the collections it puts forward. The new project implemented by the brand is part of the efforts towards a more sustainable production. Other similar projects were the Waste<Less project, which brought, at the beginning of last year, jeans made from recycled plastic bottles and food trays, using over 3.5 million recycled bottles.